Haiti Relief - Solar Solutions - Partnership International, Inc. Sustainable Relief is crucial to support infrastructure in support of overall relief efforts and longer term goals for sustainable development. SOSolar systems could be deployed to provide electricity towards relief efforts. To remove expensive kerosene and other fuel-based inferior and potentially dangerous lighting used in many developing economies and rural areas worldwide, we propose reliable, free energy charging from the sun to Increase productivity, reduce hazards over conventional fuel lighting and provide this system in a self-contained, easy to operate and rugged system. Thus we present the Solutions for Solar (SOSolar) Mini system. As shown, the system includes 3 LED lights, a 5 Watt Solar Panel, a Sealed Lead Acid 12-Volt Battery, a phone charger, and an AC grid-connection charger, weighing only 6kg (13 pounds). The lifespan of these systems is 5 years for the 3 LED lights, 10 years for the solar panel, and 1 year for the battery. Assuming an overall system life of only 5 years, the energy produced through these solar systems average to less than $0.02/kWh. In many developing economies and rural areas worldwide, energy grids are often inaccessible or potentially unreliable. To provide a solution to this pressing issue, Partnership International presents the Solutions for Solar (SOSolar) Box all-inclusive, easily maintained solar energy generation system that is scalable from 3.6 to 10.8kW. 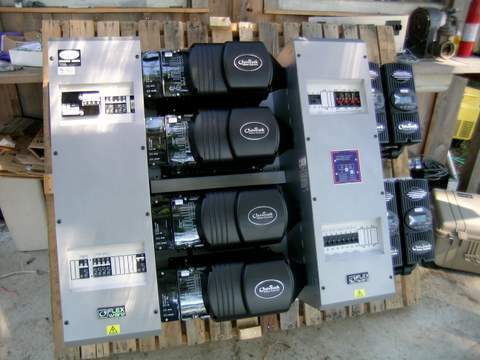 The system is supplied by PV Solar charged batteries, and can be backed up by a generator or grid connection. These SOSOlar Box systems are scalable to different applications. At the single 3.6kW inverter/charger level with appropriate battery and PV solar panel capacity, the system may serve as an off-grid power supply which can be connected to a backup generator or the grid to provide continuous power for refrigerators, computers, lighting, and other uses. Scaling up to a triple-inverter/charger at 10.8kW of power, however, can support micro grids (as shown at right), hospitals, other medical facilities, housing developments, lighting, sanitation, multiple computer systems, and many other uses.